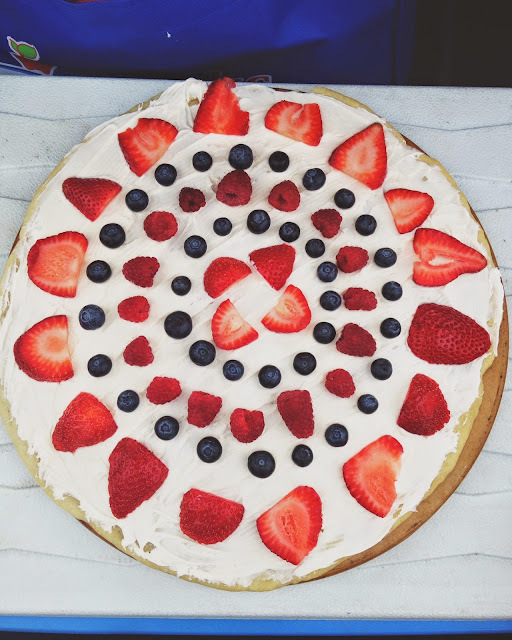 A few weeks back, I was looking on Pinterest to inspire me with Fourth of July treats. I picked the hand pies, and a fruit pizza to make. 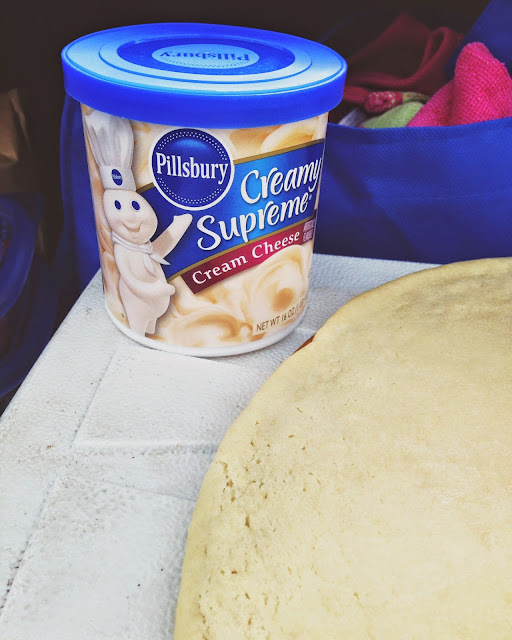 It has been a hectic few days, so I decided to not make the sugar cookie from scratch. 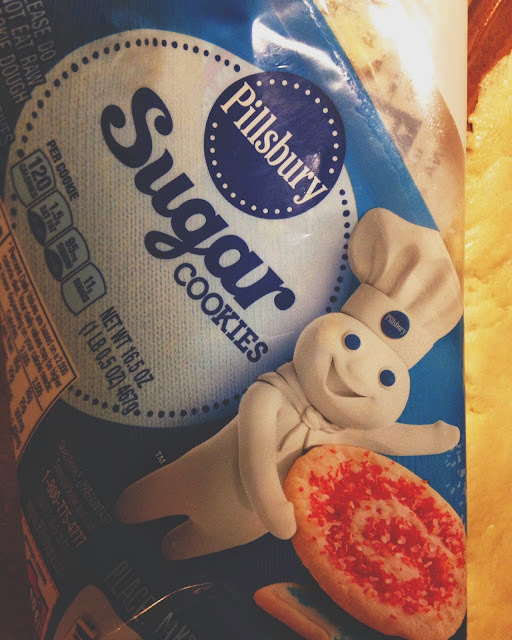 I bought a Pillsbury sugar cookie roll and just rolled it out. 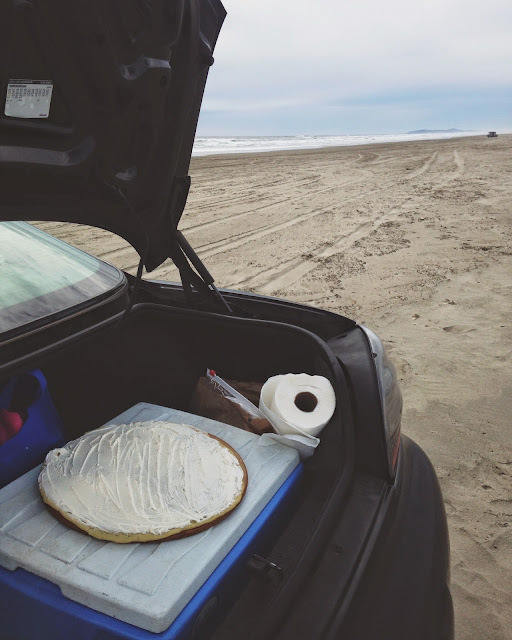 I prepared everything the night before, so I could put it together on the beach. 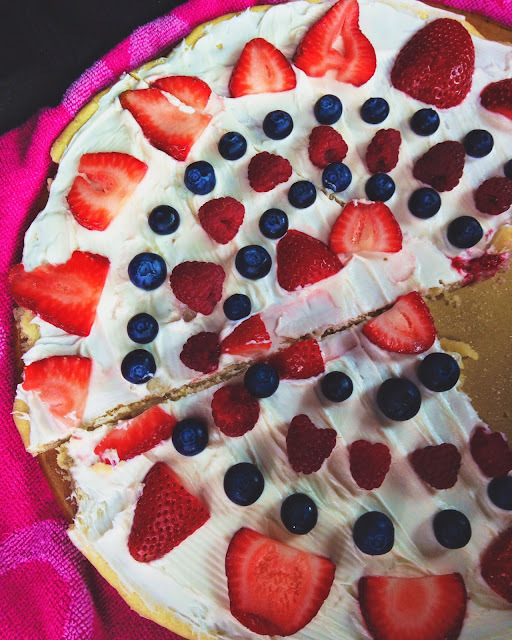 It was the perfect Fourth of July treat. I am so glad that I have left overs to enjoy. 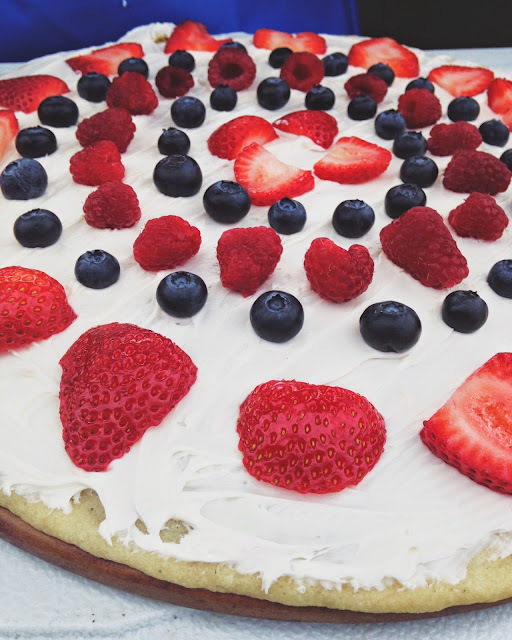 This fruit pizza is super simple, and requires only five ingredients. On an oiled, circular, pizza pan roll out the sugar cookie dough on the whole pan. Don't roll it out to the edges because when you bake it, it will spread out. Bake it at 350 for 11 minutes. After it is done baking, let it cool off all the way. I let it cool overnight. 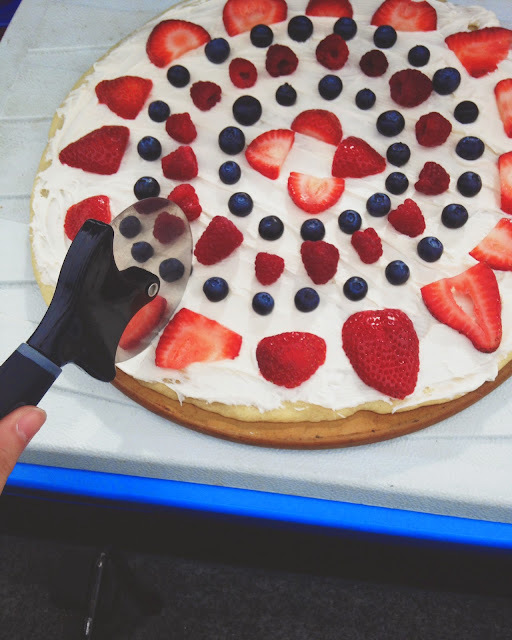 Prepare the fruit by rinsing it, cutting it, and storing it in the fridge until you are ready to put it on the pizza. I did the rest of this on the beach. Frost the giant cookie with the frosting, make sure the edges are covered, and frosted. Once it is all frosted, you can start putting the fruit on in any design you would like. 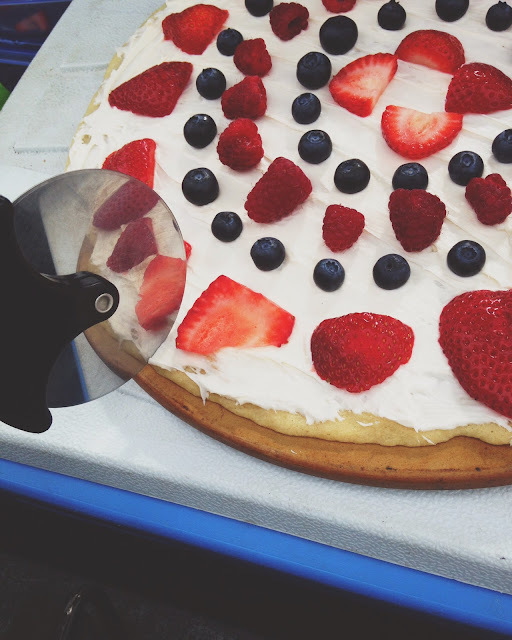 You can cut it with a knife, or a pizza cutter. I found it to be easier to cut it with a butter knife, but I did attempt to cut it with a pizza cutter. Cut it, and serve or just eat it off the pan like my mom did. I stored in the fridge, because the fruit will make it soggy when it just sits on the counter. We makeshifted our trunk into a kitchen area. We put the sugar cookie on top of the cooler and I frosted it there. 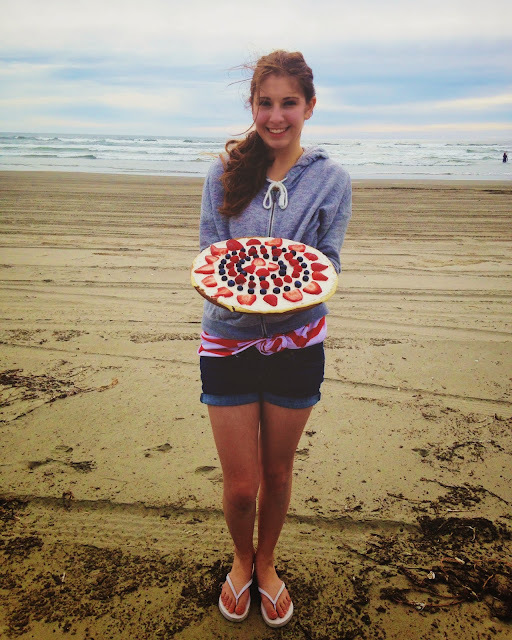 I know it is normal to make food on the beach, but to me it is a pretty fun thing. My mom said that was this awful, it was also "not good". She said these things as she was eating slice by slice. She was being sarcastic of course, but it was pretty funny. 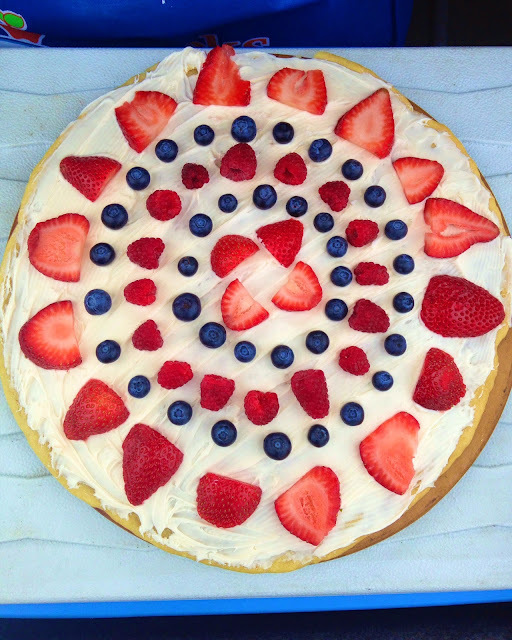 My dessert plans for Fourth of July worked out perfectly, and went as planned. So happy!